Heat oil in sauce pan. Add onions and garlic and fry until onions are slightly browned. Add all dry spices and stir well. for another 5 min. Transfer the mixture to a crock pot and mix in the remaining ingredients. Add salt to taste and mix well. Cook on low setting for 6-8 hours or high setting for 3-5 hours. Serve with chopped green chili, yellow onions, green onions, grated cheese and/or sour cream. Quantity of water can be varied depending on the required consistency. Less water is required for serving on a bun. Pinto beans can be substituted with other lentils like Garbanzo beans (Bengal gram), Mung bean or any dal, for a different texture/taste. 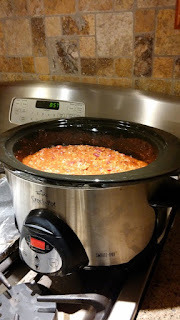 Make chili 1-2 days in advance, cover tightly and refrigerate. On serving day, add extra water/broth, as desired and cook on low for 1-2 hours. Heat oil in a large sauce pan, add cumin seeds and stir until slightly browned. Add hing, garlic-ginger paste and stir for 1-2 min. Add onions, tomatoes, green chili and cook for 5-10 min or until onions turn translucent and tomatoes are cooked. Add turmeric, amchoor, coriander and chili powder to ¼ cup water and mix well. Add this to the cooked tomatoes, stir and continue heating for 1-2 minutes. Add potatoes, cauliflower, ¼ cup water, salt to taste and stir gently to coat the vegetables with the onion-tomato spice mix. Cook covered on medium heat for 15-20 minutes or until vegetables are cooked. Add thawed peas, sprinkle garam masala and stir gently. Cook uncovered for another 5 min, to remove any excess liquid and obtain a semi-dry mix.